In the late ’50s, Stirling Moss was a driver in high demand, and one of the brands he raced for was Lister. The Lister Knobbly he thrashed some 60 years ago is the inspiration for a new front-engined, two-seater with retro styling and, most likely, Jaguar power. 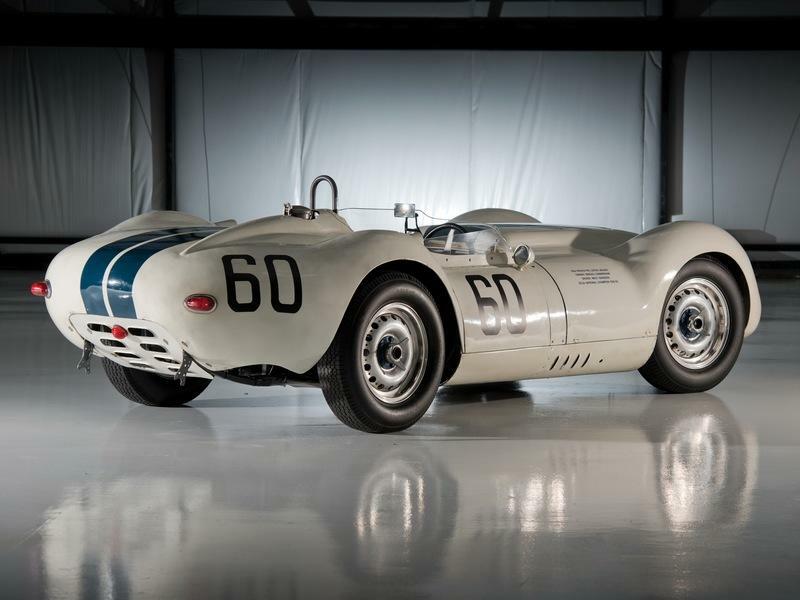 How much power we don’t know but word has it that it’s going to be a lot since the continuation Knobbly built to 1958 specifications can reach 181 mph. 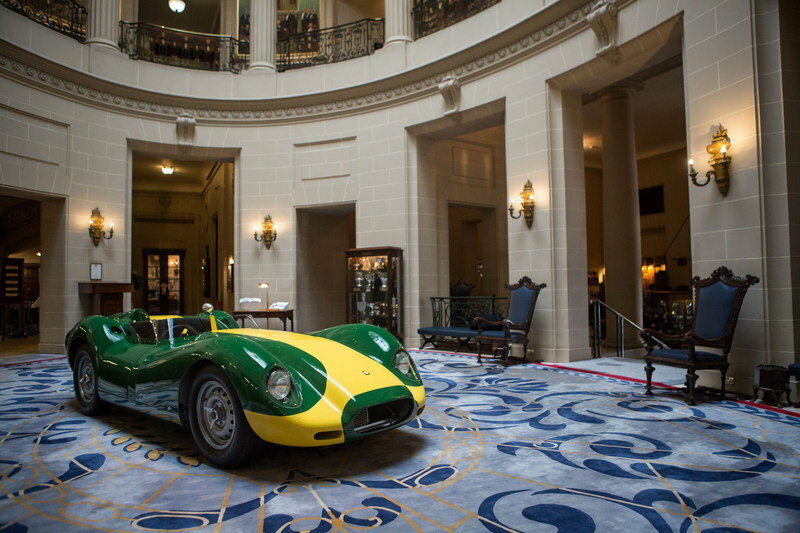 Lister, the company founded by Brian Lister in 1954, has been known for building rather successful sports cars and turning out especially quick Jaguars in its shops. Lister started out by racing a bespoke MG-engined model entered for Archie-Scott Brown, who became synonymous with the brand up until his tragic demise at Spa-Francorchamps in 1958. 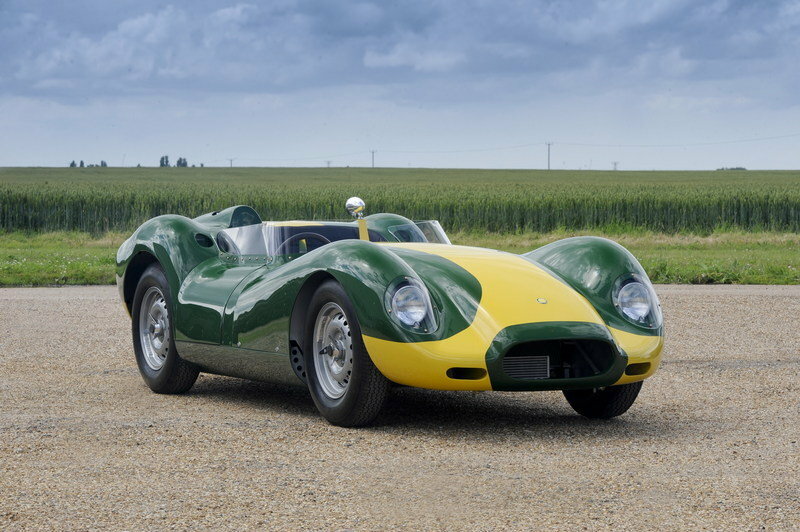 The company was revived by Laurence Pearce in 1986 and, since 2013, has been under the ownership of Lawrence Whittaker who broke the news on the production of the upcoming Knobbly. This pufferfish-like sports car could well be one of the hottest things to come out of the U.K. in the past few years if Lister converts two digital renders into an actual running and driving machine. Why? Because we’re looking at a proper retro-styled car from a builder that divides its time between building continuation models with ’50s technology and making modern-day Jaguars faster than they ever dreamed of being. In other words, here’s a company that knows how to blend old-school craftsmanship with state-of-the-art technology. We first heard about a possible resurgence of the Knobbly in late February when Lister CEO Lawerence Whittaker posted an image depicting the side of the Knobbly Concept that Lister has been ’working on.’ He didn’t offer any other details, but that image alone was enough. The bulbous arches, the long sweeping hood, the stubby tail, and the cockpit pushed all the way back are all trademarks of the original 1958 Lister-Jaguar, alternatively known as the Knobbly. But those arches no longer cover knock-off steelies, instead molding around huge multi-spoke alloys painted in black. The doors are tiny, and the side windows are narrow, suggesting a raw experience behind the wheel. Also, the winglets of the splitter that wrap around the front overhangs and are continued aft of the front wheels by the rocker panel extensions suggest extensive wind tunnel work. These parts are all probably made out of carbon fiber as is the rear diffuser which sits below the curvaceous rear end with its narrow taillights mounted across some triangular holes in the rear bodywork. To put it simply, the image suggests we could be in for a menacing vehicle. That is if Lister decides to build it. All our doubts were dashed by another tweet from Whittaker who simply said, ’we’ll build it.’ When? We don’t know. What will the specs be? We don’t know that either. How much money will it cost? Unknown as well but you can be sure it’s going to be really rare and really expensive - as it should be. The only thing we got along with Whittaker’s confirmation was another image of the new Knobbly, this time a front three-quarters shot. The image offers a clear view of the low-slung front end with circular headlights on either side of a rounded gaping mouth - just like the original. The difference is that the fenders don’t rise as much on the Knobbly Concept and the mouth is bigger which suggests the engine behind it needs a lot of air. 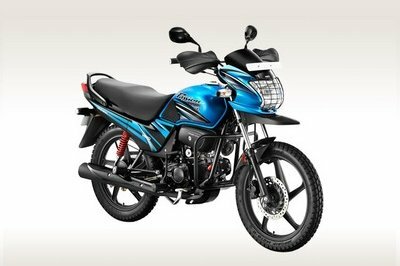 We can also see the narrow windscreen that gets even narrower between the seats as well as a pair of blue stripes that traverse the hood down the middle and come to an end just on the tip of the nose. Interestingly, the second render features a different year in the lower left corner where it says ’Lister Knobbly 2020 Concept Car’. 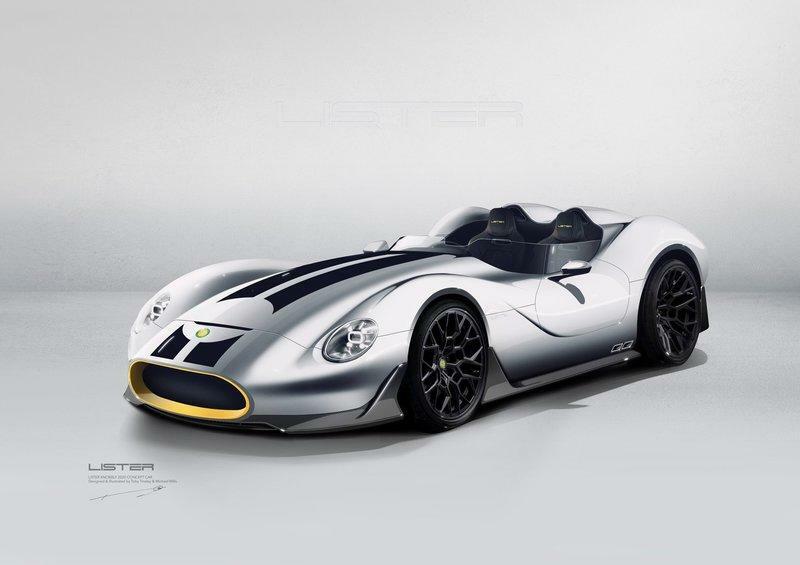 In the lower left corner of the first rendering, the "Lister 2019 Knobbly Concept" text appeared. It may be a suggestion to us to not hold our breaths for a 2019 unveiling, but you never know. How Insane Could the 2020 Lister Knobbly Be? Lawrence Whittaker’s company knows a thing or two about really fast cars. In the late ’90s, Lister went to Le Mans with the Storm that later won the FIA GT Championship against Ferrari, Dodge, and others. More recently, tuning the F-Type and the F-Pace is the bread and butter of Lister, and I reckon the Knobbly could use the engine in the F-Type maybe in an even more extreme state of tune. 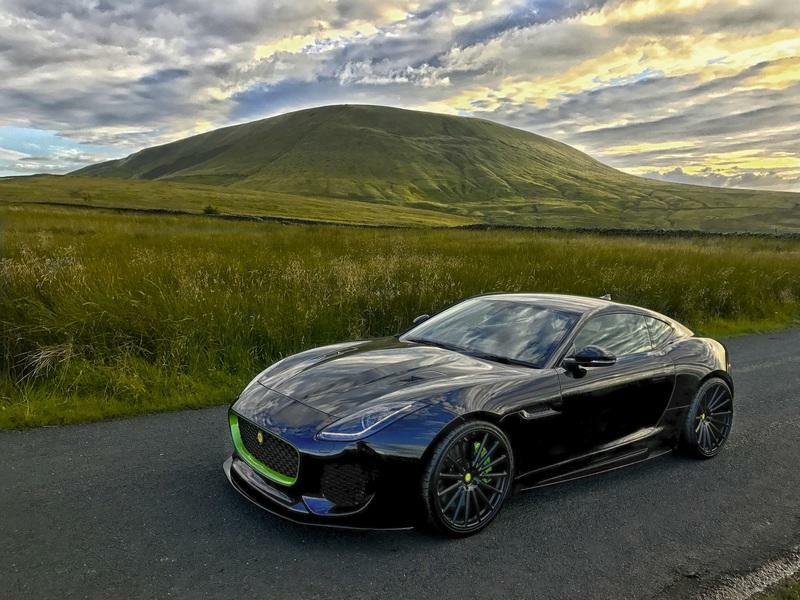 We wrote last year about the menacing Lister Thunder that proved quite popular upon release and that quickly changed its name to Lister LFT-666 to match the naming strategy used for the souped-up F-Pace baptized Lister LFP. Both of them use Jaguar’s classic 5.0-liter, supercharged V-8. In the LFP, it makes 670 horsepower (up from ’just’ 550 horsepower in the F-Pace SVR) while in the LFT-666 it puts out 657 horsepower, 82 horsepower more than the F-Type SVR - or 666 PS. Lister actually markets the LFT-666 as a standalone product, not a Jaguar, thanks to its carbon fiber body panels (like the front bumper, the diffuser, and the rear wing), different suspension components and other chassis enhancements, as well as all the modifications done to the engine. It features new supercharger pulleys, a revised intercooler, an improved air intake system, and a different ECU. Naturally, the torque went up too: from 516 pound-feet in the F-Type SVR all the way to 720 pound-feet of twist. That’s over 200 pound-feet more than in the SVR. 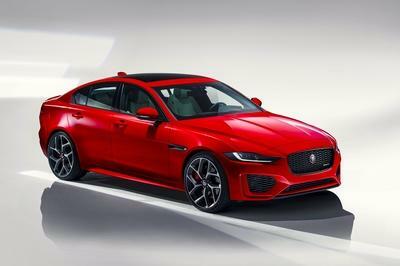 With the torque distributed between the four wheels, the LFT-666 can reach 60 mph from a standstill in just 3.2 seconds (0.3 seconds quicker than the SVR) and go all the way to a top speed of 208 mph, eight over Jaguar’s own quickest offering. Obviously, all the extra performance comes at a premium as the LFT-66, of which only 99 have been made, has a sticker price of about $185,910, a few cuts above the $123,600 base MSRP of the F-Type SVR. Glancing over these numbers, it’s easy to see Lister means business. I mean the company’s currently producing an F-Pace that puts out 20 more ponies than a Urus and can easily outpace a standard Bentley Bentayga with only 600 horsepower and 640 pound-feet of torque on that from that twin-turbocharged W-12 unit. The F-Type-based LFT-666 is also no joke, and I think the Britons will push things further with the Knobbly. In a way, they have to because people expect such in-your-face styling to come with ludicrous amounts of power and then there’re the parallels that everyone’s drawing between this concept and Ferrari’s Monza SP2 part of the Icona Series. The SP2 is the two-seater version of the SP1 powered by Ferrari’s mythical 6.5-liter V-12 capable of 810 horsepower at 8,500 rpm and 530 pound-feet of torque at 6,000 rpm. The SP2 weighs in at 3,351 and can accelerate from a standstill to 124 mph in just 7.9 seconds en route to a top speed in excess of 185 mph. 0-to-62 mph takes just 2.9 seconds. 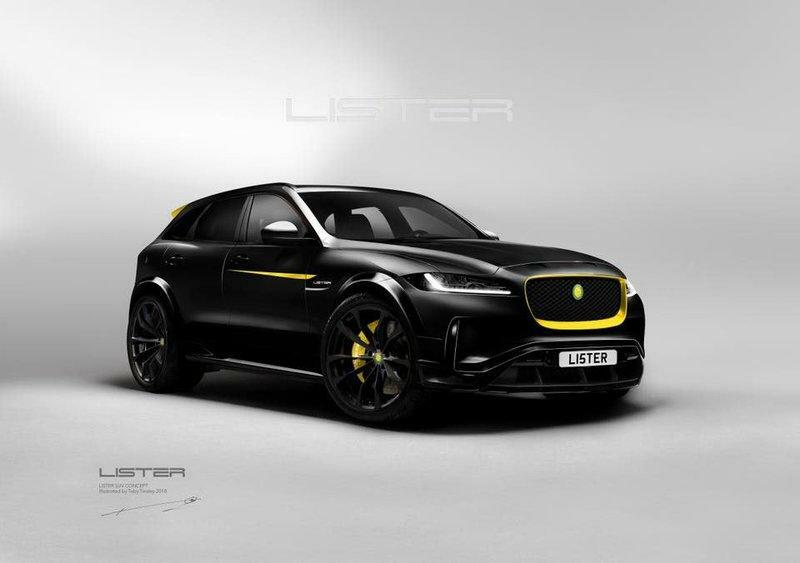 If Lister wants to measure up successfully against the Prancing Horse, it needs a +700 horsepower and +600 torques beast that’s at least 400 pounds lighter. I know that you’ll argue that not all of Ferrari’s customers will track their Monza SP2s - or maybe most of them won’t - but I’m sure someone will take it out on track to see how it handles and it would be satisfactory for Lister to put out a product that can out-maneuver a product from Maranello that’s similar in philosophy. Why Should the Knobbly Name be Revived at All? 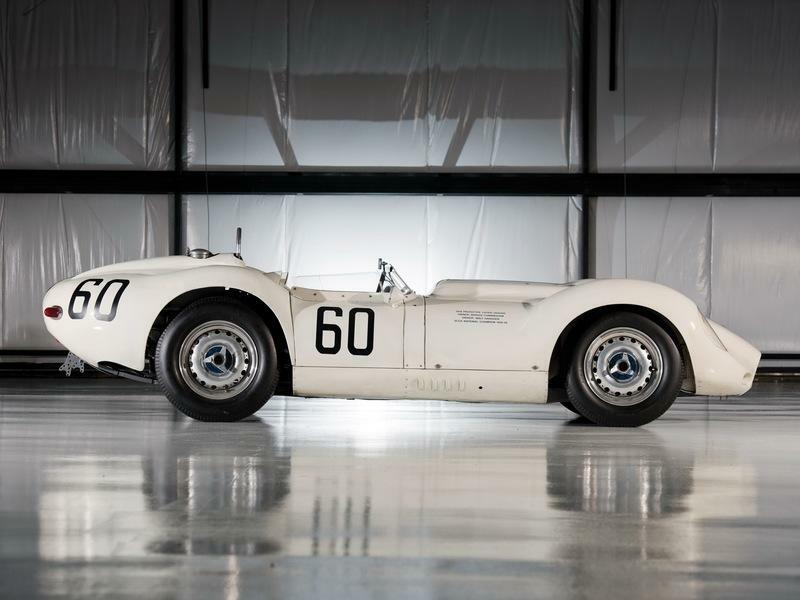 If you aren’t into ’50s sports car, you might have never heard about the Knobbly in the first place and you may question the desire of an automaker to reuse a weird name such as this one. ’Knobbly’ is used as an adjective, and it refers to something that’s ’having lumps which give a misshapen appearance.’ The name arose from the shape of the fenders and, indeed, the original does look a bit weird due to the sky-high arches, but it also looks a bit unique as a result and Lister channels that uniqueness with this concept. Then there's the fact that the Lister Knobbly was arguably the most successful sports car ever made by Lister while under Brian Lister's ownership. Laurence Pearce’s time at the helm and his Storm is worthy of its own - very separate - story, but we’ll touch on the Lister too a bit later. The Knobbly was designed by Brian Lister around the 3.6-liter, inline-six engine of the D-Type that Jaguar was kind enough to offer to Lister as the D-Type’s own career was starting to wind down. The resulting vehicle was very effective winning 12 times out of 14 starts in 1957, mainly with Archie Scott-Brown behind the wheel. Only 12 Lister-Jaguars were built between 1957 and 1958, and they boasted aluminum construction. The dry-sump unit put out about 300 horsepower at 6,500 rpm back in the days when power was hugely important since nobody knew anything about aerodynamics besides the basic idea that a slippery body shape makes you go quicker. 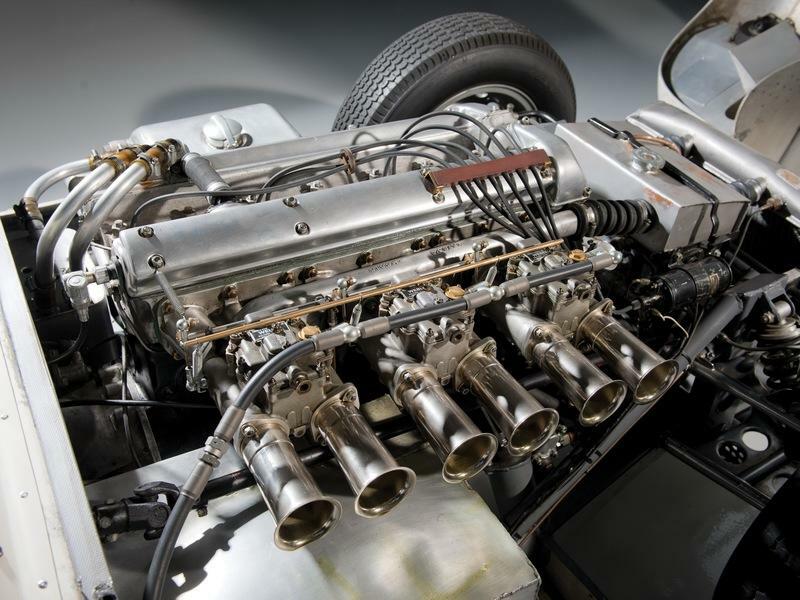 Motorsport Magazine described the skeleton of a Knobbly as follows in a 1978 article: "[the] chassis consists of two large diameter tubes braced by three cross members of the same diameter. The aluminum body is supported on a simple, steel tube framework and the suspension bolts on to fabricated uprights. Although it looks substantial, the chassis is a little bit flexible, so the Lister was never as stiff as the heavier, monocoque D-type," the author points out. The steel rims hide 12-inch drums all around. As iconic as this design is, it didn’t hang around too long as by 1959 Lister contracted Frank Costin to build a new body. Named Lister-Costin, the new car was still powered by 3.0-liter Jaguar units in the FIA races as prototypes were confined to engines up to 3.0-liters after 1957. 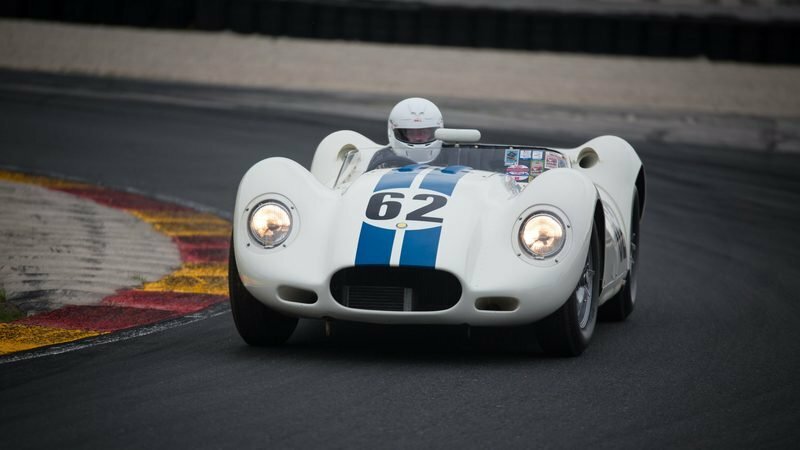 In the U.S., though, hefty Chevrolet big blocks were often stuffed in between the thin bars of a Knobbly’s (or Costin’s) chassis. But, in 2013, when Lister (now under Whittaker’s command) announced they’re plugging in its archives to build a continuation vehicle, it was the Knobbly that got a second lease of life if for no other reason than its status in period as a giant killer. We all love David vs. Goliath-style stories and the Knobbly certainly provided such a narrative in the late ’50s as it was slashing through the cohorts of Ferraris, Maseratis and even the works DBR1s from Aston Martin. The continuation model, sadly, was only ready two years later by which time company founder Brian Lister had passed away. Still, you can’t fault Lister for wanting to make this car perfect in every detail and worthy of the FIA Historic certificate. If you want one, you must know you can choose between two engines: a 4.2-liter inline-six similar to that on the XK120 and a 3.8-liter one with 330 horsepower that’s basically a D-Type mill through and through. 0-to-60 mph takes of 4.3 seconds, and top speed is 181 mph in this specification. This equates to a power-to-weight ratio six bhp above the McLaren 540C because the 60th-anniversary Knobbly only weighs 1,735 pounds. 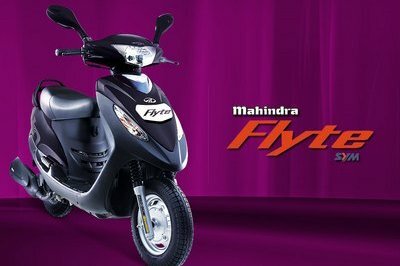 The new one surely won’t be as light, but it might be as expensive. You’ll need to fork out $392,174 for a continuation Knobbly in top trim. In 2016, Lister unveiled another Knobbly continuation model, this time a special model limited to just ten units dedicated to Sir Stirling Moss. While known for piloting the works Aston Martin DBR1s in the late ’50s, Sir Moss also had a brief stint behind the wheel of some Knobblys around the same time. He actually drove the Knobbly on just two occasions: at Silverstone in 1958 and at Sebring in 1959. The Moss Edition Knobbly looks just like the car ’The Boy’ drove at Silverstone. Under the green paint, there’s lightweight magnesium, and the engine is slightly more powerful at 337 horsepower and 295 pound-feet of torque available from 4,250 rpm. The Moss Edition can go from naught to 60 mph in under four seconds (about 0.4 seconds faster than the standard Knobbly continuation with the 3.8-liter D-Type engine onboard) and on to 100 mph in under 10 seconds. Top speed is 184 mph and the price tag three years ago was a stunning $1.33 million. What are Lister’s Other Plans for the Future? Lister seems set to shock us at the beginning of every year. In February of 2018, Whittaker talked about bringing back the Storm, fueling the rumor mill that’s been turning and turning since 2014 when we first heard stories about a sports car resurgence at Lister. 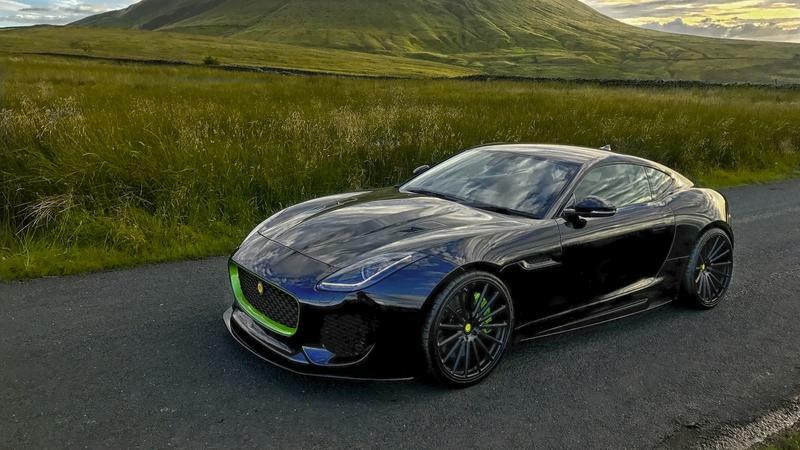 There was also a rendering posted by Lister’s CEO of a futuristic-looking mid-engine supercar, and the caption was self-explanatory: "A glimpse into the future of Lister... the Storm II." In the past, it’s been reported that Lister aims to pack inside the Storm II a 7.8-liter V-12 engine capable of churning out around 1000 horsepower. That’s enough juice for a 0-to-60 mph of under three seconds (right in Ferrari’s and McLaren’s turf) and a Pininfarina Battista-rivaling top speed of 250 mph. The original Storm was the fastest four-seat GT car in the world thanks to its huge 7.0-liter V-12 of Jaguar origin. Sadly, Lister stopped making the angular Storm 14 years ago when it also pulled the plug on its FIA GT1 campaign to focus for one more year on racing the Lister LMP racer in LMP1. Read our full review on the 2016 Lister Jaguar Stirling Moss Edition Prototype.